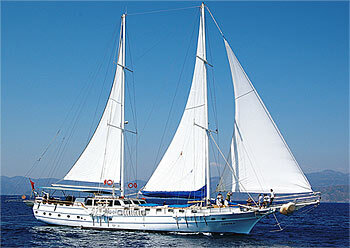 The M/S CEMRE 4 was launched in summer of 1998 as the largest gulet being built in the shipyards of Bodrum. This beautiful yacht can accommodate up to 18 adults and has numerous amenities, including air conditioning. There are nine cabins, seven with a double and a single berth and two with a double berth. Each cabin has a large private bath with enclosed shower area and plenty of hot water. Air conditioning ensures you enjoy your voyage, no matter the temperature. Indoor and outdoor dining facilities, with a spacious salon. The yacht comes equipped with surf boards, canoes and a speedboat for water ski and bingo rides. Captain Hayati and his crew enjoys setting sail at available opportunities and are there to look after all our guests needs in the best tradition of Turkish hospitality. Spacious sun deck area with Sun mattresses and cushions, Sun awning, Cushioned aft deck with a large table, Deck chairs, spacious saloon with bar and dining table, Music Set, Color TV and of Course - the crew of four have their own separate quarters. 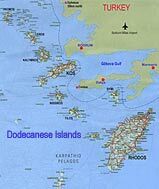 , Romans and Byzantines. Whether you're interested in history or just a relaxing get-away, Captain Hayati and his crew will do everything possible to make your vacation unforgettible. They have years of experience sailing these waters and helping fellow explorers enjoy the treasures of Turkey. Board the CEMRE and indulge yourself in the ease of life on the sea. The yacht has a spacious, uncluttered deck with ample space for lounging. The Turks are well known for their hospitality, and your crew is devoted to providing you with an unforgetable, relaxing vacation. Spend your nights on deck when anchored under the brilliant Milky Way. On M/S CEMRE 4 you will be served Turkish cuisine at its best. Crew: 4 - 5 (captain, chef, sailors) in separate cabins. Languages: English, Turkish. Washing machine, Filter Coffee, Refrigerator, Deep Freezer, Ice Boxes, Ice Maker. Cabins : 7 cabins with double and single berth, 2 cabins with double bed, very spacious and comfortable cabins. All cabins with air conditioning system and private bath rooms with shower-cabin and toilet. All cabins with portholes, wardrobe, drawer, mirror.